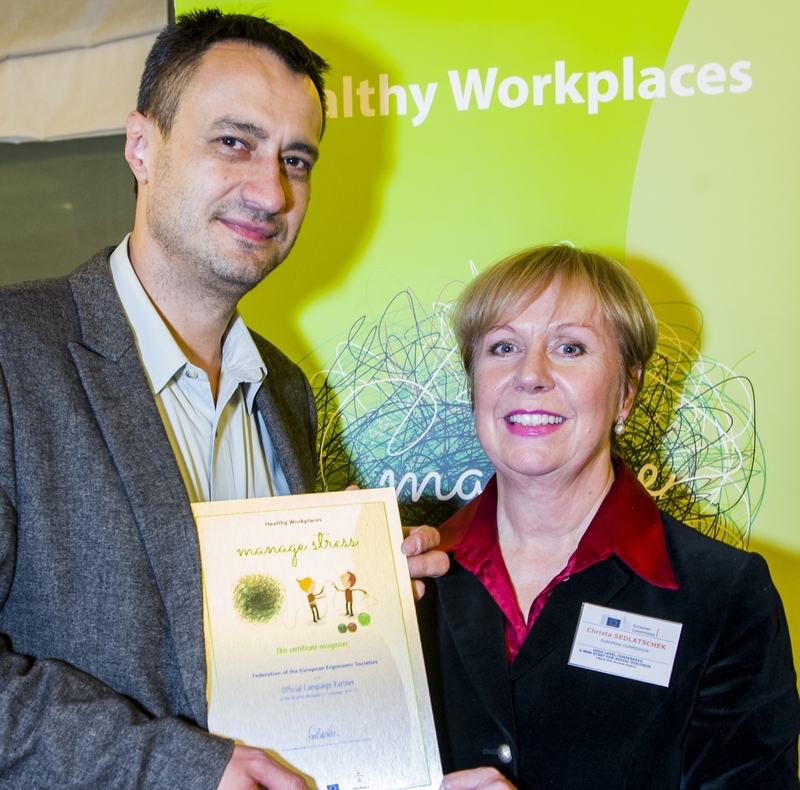 On behalf of the Federation of the European Ergonomics Societies Gyula Szabó received the official campaign partner certificate from Dr. Christa Sedlatschek, director of the European Agency for Safety and Health at Work (EU-OSHA). FEES organises events around Europe every October to discuss the role of ergonomics to achieve the campaign objectives. Therefore, the yearly FEES campaign European Month of Ergonomics EME is dedicated in 2014 and 2015 to this subject, with the title "Ergonomics for managing work-related stress". The aim of the campaign is to demonstrate the potential of ergonomics knowledge and methods in managing work-related risks and thus to promote the collaboration between ergonomists and occupational health and safety experts to work together for this subject. EME material was made by Martti Launis martti.launis@ttl.fi, Communication and Promotion Committee of FEES. This Benchmarking & exchange of good practices in OSH Healthy Workplaces Campaign Partner event organised by EU-OSHA and the Official Campaign Partners of the Healthy Workplaces Campaign clearly demonstrated the importance of managing occupational safety and health (OSH) and psychosocial risks and stress in particular. Workshop held were on the topics of: Learning from and reporting incidents and accidents; Leadership training and OSH competence; Fostering an OSH culture in organisations; and Indicators of OSH performance.